Today I found out how a firefly glows. The glow from a firefly comes from the lower part of their abdomen. This “lantern” portion has an evolutionary gift in the form of bioluminescence. The light produced by a small layer of cells called photocytes is reflected off several layers of reflective cells and emits a greenish-yellow glow. Specifically, inside the light producing cells within the firefly is an organelle called a peroxizome. The chemical party that lies within it is what creates the light. Magnesium and ATP combine with an enzyme known as luciferase and the protein luciferin. This combination creates a very excited molecule. When oxygen is introduced into the mix, the molecule goes from “excited” back to a steady state. Think of having to pee extremely badly. You begin to tap dance like Micheal Flatley on crack! Once relieved, you return to a “steady state”. In the case of a photocytes chemical reaction, this energy release is in the form of a photon of light. The mechanism that turns on and off this light show is still the topic of some debate. The prevailing theory revolves around the firefly’s ability to control oxygen within photocytes. Mitochondria (the organelle that controls ATP production) require large amounts of oxygen. When the firefly decides to light up the sky, it signals “trigger cells” around their air tubes to produce large amounts of nitric oxide. When the mitochondria inside the photocytes become soaked with nitric oxide, it results in extra oxygen available within the cell. It is thought this extra oxygen availability kicks off the chain reaction that produces light. The process involved in stopping the luminous chemical reaction within photocytes has also yet to be proven. Researchers have found that white light can reverse the effects of nitric oxide on a key respiratory enzyme found in mitochondria. Because of this, it is thought that the “off” button on a firefly could be light itself. The reason for this evolutionarily driven light show is mating. Fireflies, like most animals that procreate sexually, need to find a way to attract potential suitors. In the case of the firefly, this attraction is accomplished with flashes of visible light. When a hot-to-trot male is ready to put on his Barry White and begin patrolling a specific area for females, he will start his flash-dance in the hopes of being seen by a willing lady. The females usually sit in wait, and once an attractive male happens by that gets her fire going, so to speak, she will signal back. The male also prepares a “nuptial gift” in the form of sperm wrapped in a high protein package, which he then gives to her and the mating ritual of this bright beetle is soon accomplished. Not all fireflies use their light to attract potential sexual partners. A type of firefly known as “Photuris” will mimic the light patterns of another type, “Photinus”, to attract the males of that genus class. Once the love-struck male approaches, instead of a booty-call, the Photuris female will seize him and then eat him! Some firefly species will use blood as a means to ward off predators. The process is called “reflex bleeding”. This blood is toxic to some predators and numerous studies have shown that these predators learn very quickly to stay away from fireflies. These same studies show that these predators will also stay away from perfectly palatable insects if those insects are painted with glowing substances that mimic firefly larva. The femme fatale Photuris firefly is not able to make the toxic chemical. They are however able to gain this poison by eating firefly’s with it. Once ingested, she is able to pass it on to her eggs and larvae. The light from a firefly is usually in the range of 561-570nm on the light spectrum. This is high green-low yellow for those not in the know. Fireflies are not “flies”, they are beetles. True “flies” have only one pair of wings, beetles and other insects commonly referred to as flies, like dragonfly or scorpionfly, have 2 sets of wings or four wings altogether. For ease of understanding, when the term “fly” is hyphenated following the common name for the insect, or fly follows the common name, it is, most likely, a true “fly” and has only 2 wings. Most species of firefly are able to use luminescence as adults, but all known firefly larvae and eggs are able to achieve this feat. There are also related beetles that have bioluminescent abilities. Click beetles and Phenogodid beetles are two. 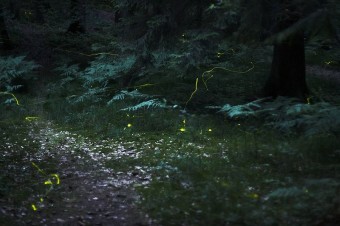 In the United States, fireflies that glow are not usually seen west of Kansas. The reason for this phenomenon isn’t known, but studies have shown only rare, isolated sightings of luminous fireflies in the western states. If you live east of Kansas and want to attract fireflies to your house there are some tips to follow. Cut down on lawn chemicals; Allow low overhanging trees, tall grass and other vegetation. This will provide adult fireflies with a place to rest and remain cool during the day. Reduce any artificial lighting around your property, which could interfere with the firefly’s signal and make it harder for most species to locate a mate. There are currently over 2000 known species of firefly around the world. This is the one of the most common punctuation errors. The apostrophe is ONLY used to either: 1. Indicate possession (Mike’s bike) or 2. Take the place of other letters (“don’t” for “do not”, “won’t” for “will not”). The apostrophe is NEVER used to indicate plurality.